What are the advantages of buying a certified diamond and what is the best certification to get? I’ve been researching diamonds for engagement rings, and I keep seeing different certifications. What certifications should I be looking for, and what are the advantages of buying a certified diamond? A certified diamond is supposed to match the qualities on it’s papers. The only really good certifications in the US are EGL (European) and GIA (American). A second-class choice is IGI. If you see nearly any diamond that is smaller than a carat and “certified” then it is likely one of those knock-offs. There are many others of course that issue papers (think crummy mall store) but are not very quality, just like the CKC will register dogs from a photo. A certified diamond will also come with a “map” showing the inclusions in the stone, which if you are worried in that a bad jeweler has stolen your stone you can compare it to the map and see. It also is easier to sell/trade your diamond if it is certified because the quality is easy to know. A certification will make a stone a bit more expensive generally, but you can be sure that it is not misrepresented to you (as long as it is from the ones I told you were good). 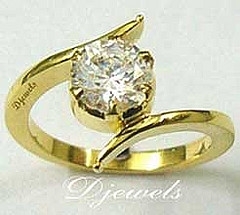 I recommend going to a small family jeweler for the best price and quality on diamonds. When I worked at a family jeweler our profit margin on diamonds was 30%, with a lower markup on the better quality diamonds to keep them affordable. The mall stores have more than 100% markup– any store that does a 50-75% off sale regularly logically is ripping you off. This entry was posted in Glittering Diamonds and tagged diamond, diamonds, engagement, jewelry, wedding on November 18, 2009 by admin.